If you've been walking around Austin and paying attention, you might have seen a Zelda-themed treasure chest hiding just off the beaten path. It's not the only one, thanks to a local street artist who just wants to add a bit of adventure to your daily routine. "Ez" (pronounced 'easy') lives in Austin and took up drawing and painting as a hobby, using the simple palette of The Wind Waker as a starting point to learn to mix colors and emulate an art style. Eventually that resulted in piles of Zelda-themed art around his house, which he decided to start turning into street art. The pieces have taken the form of everything from perler bead sprite art to treasure chests filled with stained glass to crocheted bomb bags. The first piece to be hidden was 20 feet up a cliff Ez describes as "Scary getting up and down." You can see it from a distance and, on closer inspection, you're rewarded with something to aid you on whatever journey you might be taking. The first hidden treasure chest included a note with an email address asking for a picture or thoughts. Only one person replied but, after checking on the box, he found that people took the art inside but replaced it with gift cards, lottery tickets, movie tickets and other assorted treasures of their own. When I asked if he hoped that would continue now that his work has been seen on Reddit, he said that it isn't up to him what happens to the art. "I'm hoping the honor system kicks in there — that might be the most naive thing I've ever said. But I'm hoping the honor system kicks in. I think the people who are looking for this know that there are other people looking for it. You know, just take what you want. It would be really cool if people keep it going forward and take something and leave something. Once it's out there, it's out of my hands, and it's up to the culture of people who are out there to decide how it works." 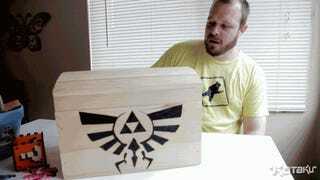 The box in the video above is the third Zelda-themed treasure chest to be hidden in Austin. Since this interview, the box has been completed and hidden in the city. Originally, after a post on Reddit got a lot of attention, Ez planned to give a hint to the hundreds of people who had emailed him. Since then, due to personal issues taking up a lot of his time, he decided to keep it simple and stash it without warning (he didn't tell me where, so don't ask). However, he has bigger plans for the next treasure chest that will appeal more directly to all the people waiting for a clue. "For the next box, I am going to contact the people that have sent me notifications. I am almost certainly going to do a multi-part hunt. So I'll set that up on a Friday evening that coincides with some good weekend weather and then send out the emails to those people along with a hint. I won't post anything about the locations to tumblr. I'll probably not post any of the final pictures to tumblr until at least a week after it has gone live and been thoroughly pillaged. Don't want to spoil the experience. There's a really nice park in [REDACTED] that is underutilized with a great many secret and nifty places off the [REDACTED]. I'll probably do a series of clues and maps there that ultimately lead to the box." If you'd like a hint for the next box, you can send an email to hyruleinaustin@gmail.com. If you're not in Austin, or just not lucky enough to stumble across any of this, you can follow along on the Hyrule In Austin tumblr. Steve Marinconz is a freelance video editor. You can follow him at @appleguysnake where he mostly talks about procrastination, cookies, and the weather.